Sounds kind of threatening, doesn’t it? Cement shoes… Calabrian Ricotta Balls…. Fuggetaboutit? I think not! These little tesori will be the best ammo you’ll have in your arsenal the next time you have to cook for the family! It took me a while to release this recipe because I wanted to keep it in my family. It’s also my husband’s second favourite dish after Spaghetti all’Olio e Aglio… But these little bundles of love make us so happy that we just have to share it! Making my own ricotta has been a weekend hobby of mine for years. I like to roll up my sleeves and get the lemon and cheese cloth out and make it the way our foremothers did. It’s good, honest, old-fashioned food-preparation just like making bread or pasta from scratch. My friend Gina and I were talking recently about how the women of Calabria used to make Ricotta by hand. Gina came to America from the Calabria region of Italy in 1965 and enjoys the recipes from the old country just as much as I do. 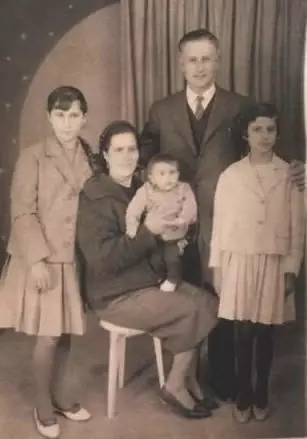 She and her husband, Vito, enjoy the old-fashioned flavours of home so much that they opened a restaurant in Los Angeles many years ago to bring the flavours of home to their new milieu. 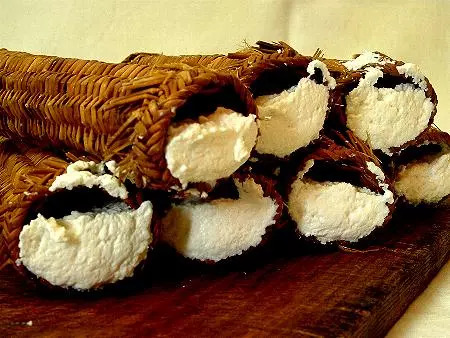 In her town, the women used to make ricotta using vinegar or lemon, to seperate the curd from the whey, and they would drain it in small cylindrical baskets before serving it or taking it to the market. In the modern era, Italian women now use the atypical white plastic basket sieve that we see in the front windows of so many macellerie and salumerie in Italy. So with that brief bit of background, let’s make some Calabrian Ricotta Balls! This recipe is a very different recipe as far as cheese presentation goes. It is a main course that is served hot and is very popular in southern Italy. It’s a simple recipe that takes a few hours to prepare but the reward is so wonderful: Comfort food at it’s best that would make any Nonna cry in her grappa. You can use a standard 500 gr tub of Ricotta in the recipe below or you can make your own ricotta using our Homemade Ricotta recipe. If you choose to make your own ricotta plan to do it the night before you make this recipe. If you choose to use a store-bought tub, be sure to drain it adequately in a sieve or with cheesecloth to make sure you’re working with a drier, firmer texture when you begin the recipe. Sautee the garlic and shallot until golden. Reduce the heat to medium and pour the wine over the garlic and shallots, letting the wine reduce for a few minutes. Place the rest of the ingredients into the pot, bring it all to a gentle boil and then let simmer for an hour or two. While the sauce is reducing and simmering, begin to make the ricotta balls. First, preheat the oven to 350F/180C/Gas Mark 4. 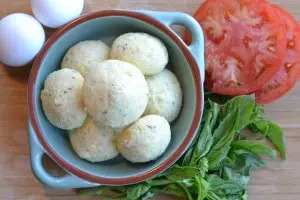 To being preparing the ricotta ball mixture, combine the ingredients above into a mixing bowl. Using your mixer (or good old-fashioned elbow-grease!) mix the ingredients thoroughly. After mixing roll the ricotta balls by hand using an ice cream scoop or soup spoon to size each ball evenly. Don’t make them too big! Place each ball on a lightly oiled or non-stick baking sheet and bake them for 20 minutes while the tomato sauce continue to simmer. When they’re done, take them out of the oven and let them cool for a few minutes. On a dinner plate or in a shallow dish serve 1/2 – 1 cup of tomato sauce and place 4 or more ricotta balls on top of the sauce, sprinkle with a light dusting of oregano. Serve with a side of pasta or vegetables and enjoy! In our home, we accompany this dish with Spaghetti all’Olio e Aglio or Sauteed Cicoria Greens. Another option is to drop the ricotta balls from the oven directly into the sauce for another 30 minutes to simmer and absorb some of the tomato flavour prior to serving. The possibilites are endless with ricotta balls: They’re are a lovely vegetarian alternative to meatballs, they go well cold on top of salads, and kids enjoy them too. Stay tuned for more recipes with ricotta in the weeks to come! Buon appetito and good eating to you! Here I thought I invented this!! I’m not Italian (so sad!) and thought I came up with this as a lighter meal sans meatballs. I don’t use breadcrumbs but instead use dried parsley flakes and it seems to work beautifully!! Making again tomorrow! So glad I saw your post! It’s so comforting, isn’t it? LOVE this recipe! 🙂 Thanks for your comment, Abi!